Discover interesting facts and information about the Longhouse. A Longhouse was a typical structure used as a house by most of the Northeast Woodland tribes who made them their homes. Longhouses are also referred to as Birchbark Houses in reference to the material the tribes used to cover the framework of their houses. Learn about the structure and the interior of the Longhouse with pictures and images together with facts and information about the tribes who used them, including the famous Iroquois tribe. The Longhouse (or Birch Bark House) was a long, narrow house that was traditionally built by the American Native Indians of the Northeast Woodlands. The main tribes who used the longhouse were those belonging to the powerful Iroquois Confederacy which included the Mohawk, Oneida, Onondaga, Cayuga and Seneca people. The men of the tribes were hunters and fishers whilst the women raised corn, beans, squash and tobacco. The Iroquois were also known as the Haudenosaunee or the "People of the Longhouse". The term 'longhouse' referred to the construction of their dwellings and their communal lifestyle. Members of the same clan shared a longhouse. 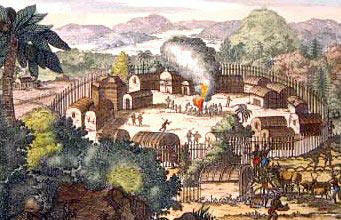 Inter-tribal warfare was harsh and frequent so that people of many of the tribes lived in longhouse villages which were fortified by fencing (palisades) and reinforced with mud. The Iroquois and many other Tribes in the Northeast lived in villages surrounded by a fortified fence called a palisade including the tribes belonging to the Powhatan Confederacy. The densely populated, longhouse villages served the Woodland tribes well for hundreds of years but living in close proximity to each other made the tribes vulnerable to European epidemics. Other tribes who lived in Longhouses included the Abenaki, Fox (Meskwaki), Huron (Wyandot), Lenape (Delaware), Mohican, Narragansett, Sauk (Sac), Pennacook, Pequot, Powhatan and the Wampanoag. 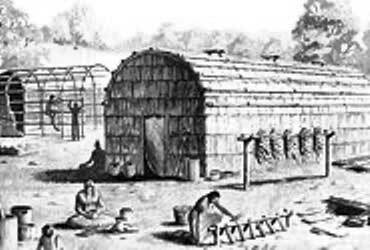 Longhouses were the names given to the permanent houses built by the Iroquois. 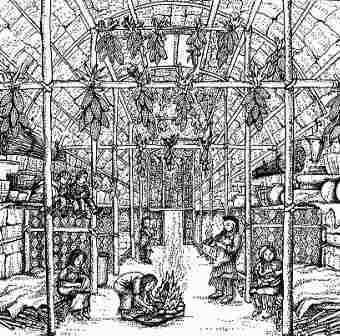 The Longhouses were built up to 200 feet long, 20 feet wide and 20 feet high. The frames of the longhouses were made with poles which were covered with bark that was cut into rectangular slabs. A variety of different trees were used to build a longhouse, depending on the tree’s strength, flexibility and resistance to decay. 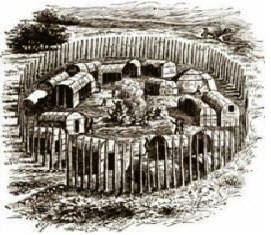 The roof of a typical Iroquois longhouse was rounded rather than peaked. There were two doors for the entire building, one at each end. Separate rooms were created in longhouses by using wooden screens and mats. Through the house from doorway to doorway ran a central passage: the space on either side of this was divided by partitions of skins into a series of stalls, each of which was occupied by a family. A series of fires were placed in the central passage for heating, cooking, and light, the smoke escaped from a hole left in the roof above it. Some longhouses had 2 storeys. A raised platform created the top storey of the longhouse which was used for sleeping or storage. A large house of this kind might have five or even more hearths, and would be occupied by twenty or more families. The symbol of the family or clan was placed on the exterior of the longhouse building. A Longhouse would have been very dark and smoky inside as there were no windows. Each family lived in a compartment. Above the compartment was a storage shelf for essential items such as clothing, blankets, mats, pots, tools and weapons A large, deep storage pit, lined with bark and grass with a bark mat lid, was was dug inside the longhouse and used to store food. Dried food was hung from the rafters. The sources of light were the smoke holes in the roof of the longhouse, from the light of the fire and during the summer there would have been light from the doors at either end of the longhouse. During the winter the doors would have been covered with animal hides to keep the cold and animals out. 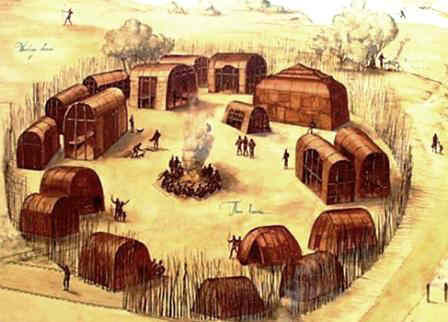 Indian houses, such as the longhouse, contained little or no furniture. Some blankets or skins served as a bed and there were no tables or chairs.